Winter. Sunday market day. At the Lavra’s walls a festive crowd gathers-peasants on foot, merchants and wealthy philistines-all rush to the bazaar. Someone came to buy things necessary in the household, who, on the contrary, sell, someone else did not dare to buy, but decided to ask the price yet. And who simply “take a look at” goods, people, meet the right person, listen to news and gossip. But the lottery boasts of his goods: “Buy pies, tasty, hot, no one bakes like my mother-in-law! Buy, check, you will not regret!” Against the background of white snow, red, blue, yellow clothes of peasants, painted sledges, bundles of balloons bloom with bright colors… And above it all, there are the walls and domes of the cathedral, the bottomless blue sky. The picture evokes a cheerful mood. 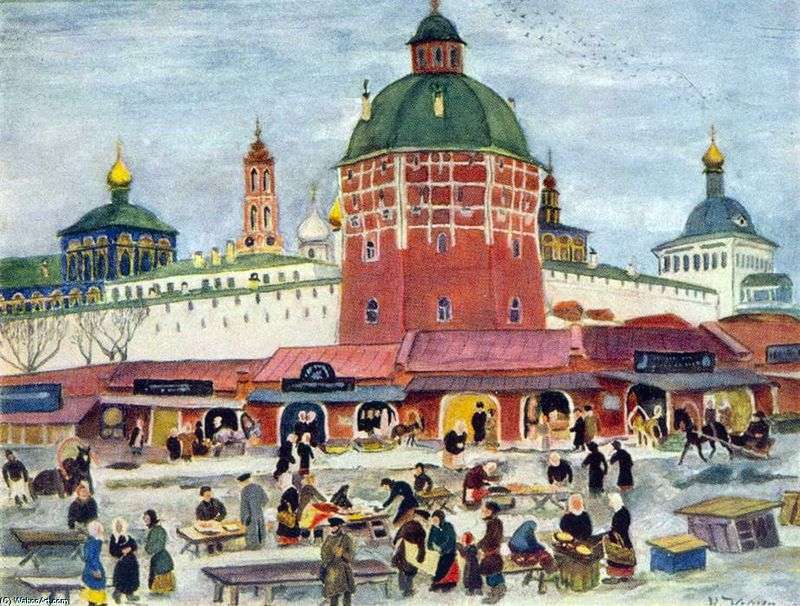 Description and meaning of the painting Bazaar at the Trinity-Sergius Lavra by Konstantin Yuon.